I just came across a month-long blogging challenge called reverb10, which asks participants to respond to writing prompts that help us reflect on 2010 and send out good vibes for 2011. Wanna join in the fun? Check it out here. It started December 1, so I’ve missed a few days. And since the rules tell me not to worry about it, I won’t. I’m just gonna pick up with today’s topic. The last thing I made was oatmeal. This morning. For my younger son’s breakfast. It involved two “ingredients”: water and a packet of organic instant oatmeal. Yes, I know how much healthier the non-instant, steel-cut, rolled, stir-until-your-arm-falls-off kind is. It’s not that I don’t love my son enough to do it. It’s just that I’ve got only so much energy to give to breakfast on a school day. OK, let’s be honest … on any day. What’s most important is that making oatmeal made my kindergartner happy. We’re talking “I looooooovvvvvvvve oatmeal” happy. He asked for raisins to put in it, then gleefully pushed each one down into its own individual mush pit. In our house, oatmeal is a sure sign that winter’s coming. No one wants to touch the stuff in nice weather. The box I dipped into this morning has been sitting around gathering dust, probably since March, just waiting for that nip in the air to return. 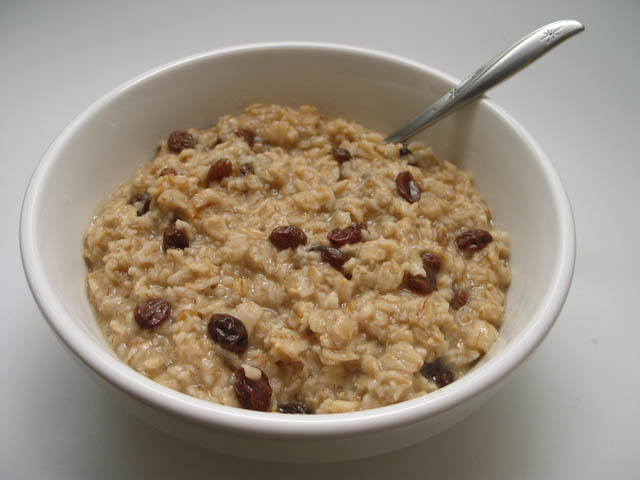 On a cold, windy day like today, oatmeal — even the instant kind — is like manna. It fills and warms my son’s body. And that fills and warms my soul. For 2011, what I plan to make are more commitments, to my family, to my business, to my physical and spiritual well-being. More on that in the weeks to come. What would you like to make? How will you go about it?